Landscape Use: Trellis, arbor, wall and fence covering. Form & Character: Agressive, delicate, tropical. 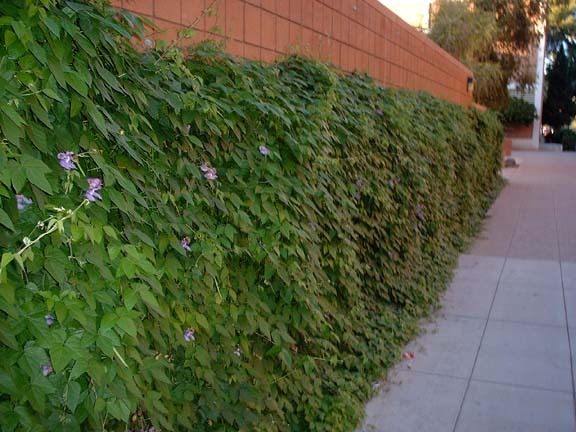 Growth Habit: Snail vine is a tender, evergreen, herbaceous perennial that is a vigorously twining tropical evergreen vine to 100 feet. It needs structural support such as a fence or trellis to twine upon. Foliage/Texture: Alternate, trifoliate (three leaflets/leaf) leaf, leaflets ovate to lanceolate to 3 incehs; medium texture. 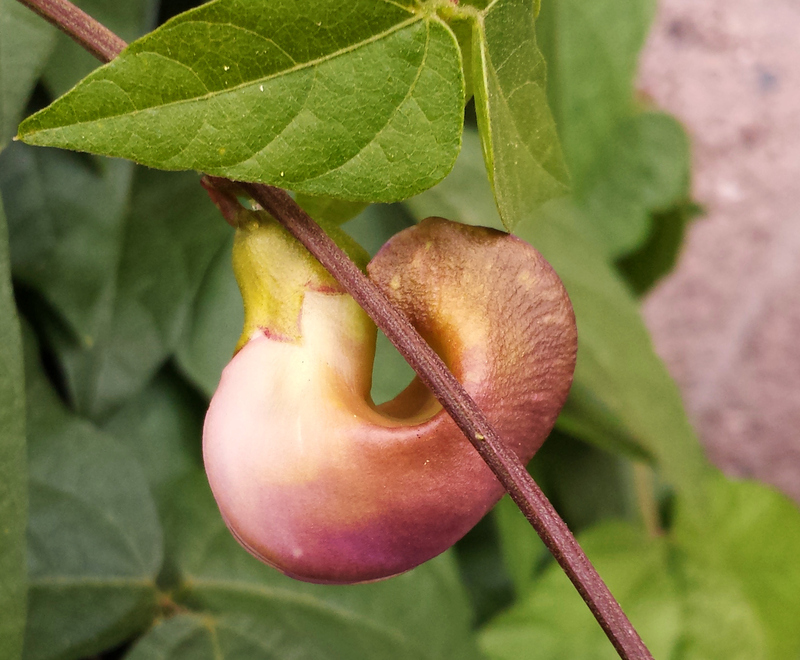 Flowers & Fruits: White to bluish purple (most common), classic pea flower, flower buds have a distinct hooked spur or keel, sometimes fragrant; fruit is a linear pod to 7 inches long. Seasonal Color: Flowers in spring, and then sporadically during summer. Temperature: Cold sensitive snf subject to chilling injury below 40oF. Light: Partial shade to full sun when mature. No western exposures in Phoenix. Watering: Apply irrigations regularly throughout the year, drought sensitive but use water to control the vigorous growth of this vine. Pruning: Shear or head back vigorously to control spread, needs support to climb by twining. Propagation: Asexually by softwood cutting under high humidity, seed. Additional comments: This is a nice, but extremely ('DANGER!!...DANGER!!) 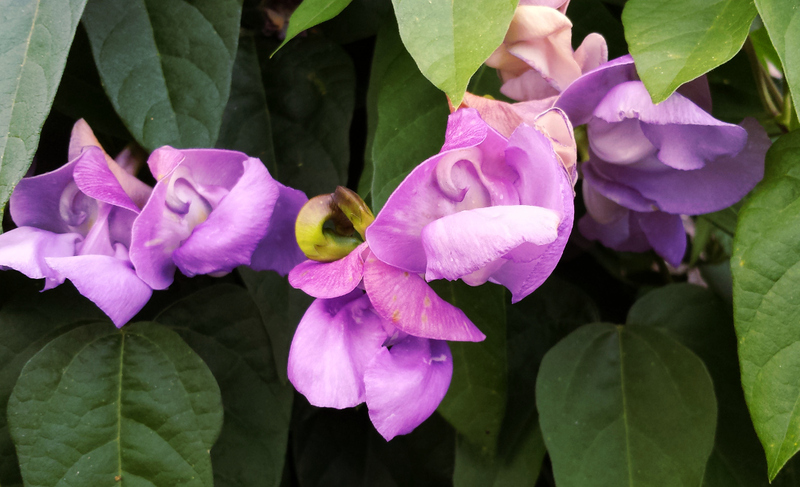 vigorous vine for a tropical landscape effect where purple blue flowers are wanted to give a subtle cooling effect. 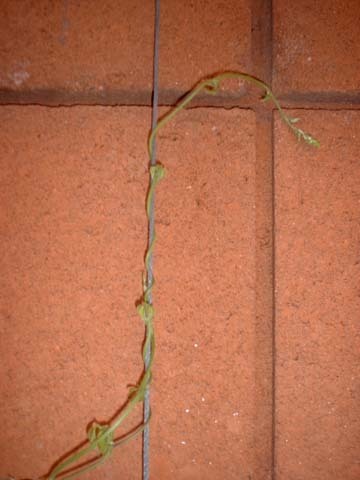 Snail vine can occassionally freeze to the ground during the Phoenix winter but will rapidly re-grow in the spring. 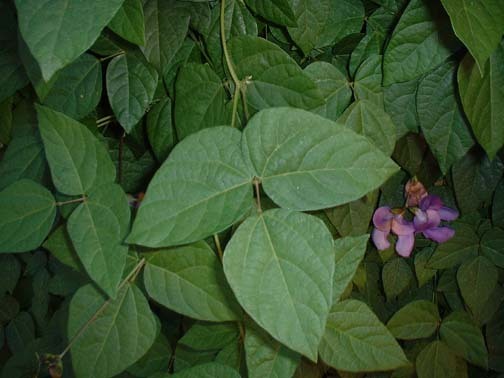 Vigna contains over 200 species and is closely related to the genera Phaseolus and Hardenbergia. The species name caracalla means that which is from Caracas, in Venezuela.